All transactions are safe and secure with a reliable history in online purchasing behind each of our associates. 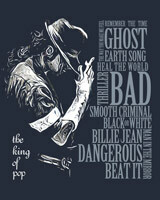 Buy the Michael Jackson Songs t-shirt to own Michael Jackson clothing and merchandise. Whether you were witness to Michael as a child singing on the Ed Sullivan show or heard him for the first time in Scream with his sister Janet Jackson on MTV, this icon will forever be engrained in our lives as the "King of Pop". These Michael Jackson t-shirts display a stylish rendering of the "King of Pop" next to some of his most well-known songs, including Beat It. Wear it under red Thriller jackets. Pair it with a Piano Keys Beat It t-shirt to add to your Michael Jackson merchandise collection. In addition to the Michael Jackson Songs tee above, browse the Michael Jackson Clothing Gallery for more apparel like men's and women's clothes, kids shirts or hoodies.